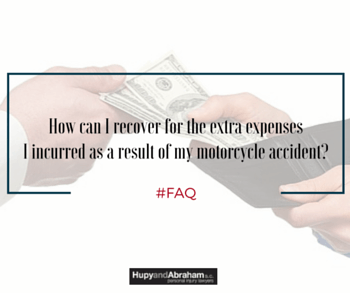 Recovering Out-of-Pocket Costs After a Motorcycle Crash | Hupy and Abraham, S.C.
Insurance deductibles for things such as property damage to your bike. These costs are adding up, and you wouldn’t have had to pay them but for the injuries that you sustained in the motorcycle accident. However, in order to recover for your out-of-pocket financial losses you are going to have to prove two things. First, you will need to prove the value of your losses. This may include saving receipts for expenses that were already incurred and hiring expert witnesses to help establish the value of any reasonable future out-of-pocket costs. Second, you will need to prove that you incurred these expenses because of the injuries that you sustained in a motorcycle accident that was caused by someone else. Medical records, your doctors’ testimony, evidence about the impact of your injury on your daily living activities, and other evidence may be important in establishing this causal connection. During the discovery phase of your claim, you should expect the defendant to ask you, under oath, whether you had cleaning help, childcare and whatever other out-of-pocket costs you are claiming prior to your accident. It is important to tell the truth. Your lawyer will be in the best position to help you if you are honest about your expenses, if you keep receipts of your costs, and if you hire an attorney to represent you before you start negotiating a settlement.